I may have mentioned in a previous post that I completed Catch-22 since my copy was from the library and it was due after three renewals. So, while I wait for everyone to catch up to me (insert smiley face here!) :), I thought I’d get back to my Friday posts by chatting about some of the other books I’ve been reading. 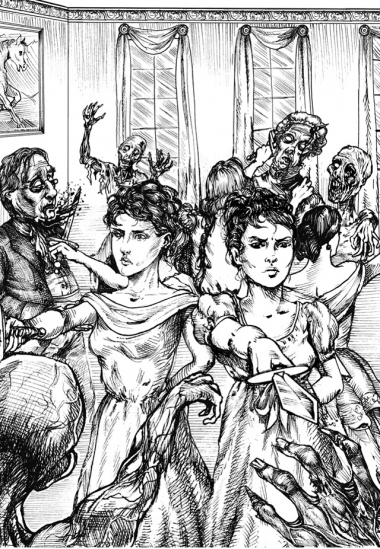 First up is Pride and Prejudice and Zombies, by Jane Austen and Seth Gramme-Smith. Since Pride and Prejudice is my second favorite book (Persuasion, by Jane Austen, being the first), I figured I would try another version of it. I didn’t want to be some haughty English major who crinkles her nose at the slightest hint of someone messing with Jane Austen. And while I do that with sequels to Austen books that other people have written, I thought this would be a fun romp. And it was! Although, I actually think the author could’ve taken it even further. The book opens with the line, “It is a truth universally acknowledged that a zombie is possession of brains must be in want of more brains.” And so it begins. The book is a mash-up that uses the language and sequence of the original and then just adds in this smattering of zombies and general mayhem. Both the original and this version are set in the quiet English countryside, where Mr. and Mrs. Bennett are raising their five daughters, who are all now becoming of age to marry. Since there are no sons in the family, the estate will be entailed away to the nearest male relative, Mr. Collins. Therefore, the girls will have to marry well in order to have security and comfort in their adult years. While the oldest sisters, Elizabeth and Jane, want to marry for love, they also know that their marriages will set the standard for their sisters. If they marry well, other well-to-do suitors should follow for the younger sisters. In addition to this original premise, in this version a plague has fallen upon the town of Meryton and the dead are returning to life. So in addition to the painting, drawing, and handiwork skills that the girls have been trained in, their father has also ensured that they have been trained in sword work and hand-to-hand combat. This premise actually fits in well with the original story. For instance, in the original the militia regiment comes for a season of rest in Meryton. In this version, they come to Meryton to subdue the zombies. In the original, everyone worries about the girls walking or riding on horseback alone. In this version, it really is unsafe for anyone to be alone with all the zombies in the area. One of my issues with the book is that is follows so closely to the original that I had the impulse many times to just put it down and read the original again! On the other hand, although the author didn’t add as much new content as I was expecting, he did manage to create a world where undead uprisings, zombie attacks, honor killings and hand-to-hand combat fit in perfectly with tea parties, balls and choosing the proper husband, so that is quite a feat. This book was optioned for a movie, although I couldn’t find any information on the potential key players except for a list of actresses that chose not to play the lead and an article about how the movie recently lost its third director. So it may be best to just enjoy this in book form for a while.